This DSP version of Unity Audio's Mini Rock gives users greater control over the audio signal in the same great compact design of the Analog counterpart. Introducing a DSP Mini-Rock version replacing the standard analog input crossover. 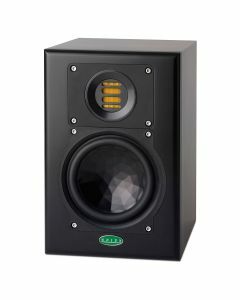 Unity Audio launched their new Mini-Rock 2 way active monitor at the 2018 NAMM show. As the name implies, this new addition represents the smallest model in the company's professional active monitor range to date measuring 279mm high, 184 mm wide, 256 mm deep, (10.98" high x 7.24" wide x 10.07" deep). A new crystal membrane woofer measuring 150mm ( 5Â¾" ) has been selected. This eye-catching surface of the crystal membrane is more than just an attractive design feature. The crystal-shaped inverse aluminium dome is joined to a paper cone in a special gluing process to result in the desired sandwich construction. The crystal cone aluminium-foil stamping stiffens the aluminium dome, diminishing resonances and minimising coloration, while improving power handling and dynamics. The voice coil design of the woofer results in an expanded frequency range, and driver surround allows for longer cone excursions for truly prodigious volume and lowest distortion, a unique engineering achievement for a driver of its size. On the rear panel the Mini-Rock has a balanced XLR input connector and stepped volume control feeding a dedicated custom designed crossover stage. Using high quality expensive IC chips to ensure the audio signal path isn't compromised the crossover is at 2.7kHz 4th order Linkwist-Riley design.